Update: Beijing Cream reports that the site is now unblocked, as of August 7. Bloomberg was blocked in China in June 2012 while the NYT went dark in October, months after having its Sina Weibo account deleted, after both news companies published investigate reports into high-ranking politicians: Xi Jinping and (ex-President Prime Minister) Wen Jiabao respectively. In comparison, it is not entirely clear what WSJ has done to elicit a block, or whether it will be permanent. Access to both the NYT China and main Bloomberg websites remain blocked in China to this day. 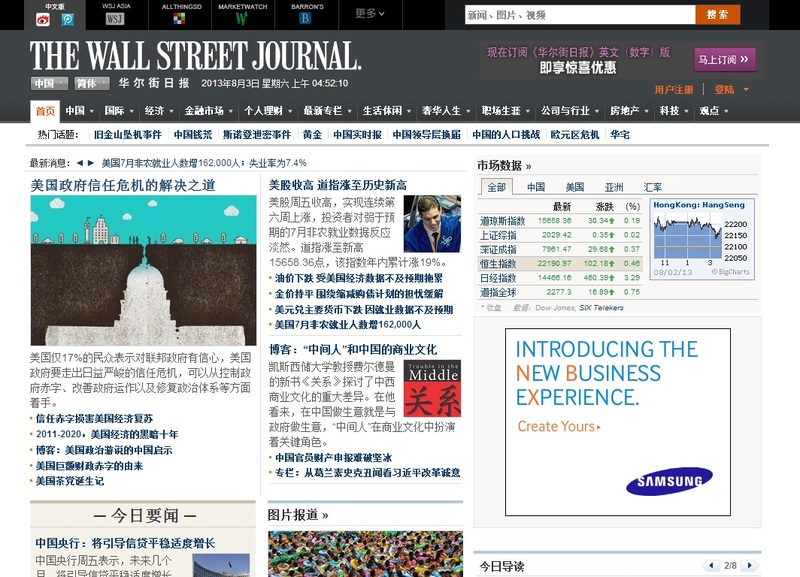 It has been an eventful past year for WSJ in China. Like the New York Times, which suffered a four-month long campaign of hacks from what were believed to be Chinese hackers, the Journal came under attack from China’s cyber army. Owner Rupert Murdoch took to Twitter in February to lament the fact that the attacks were continuing days after WSJ bolstered its network security after its computer systems “had been infiltrated by Chinese hackers for the apparent purpose of monitoring the newspaper’s China coverage”. China is notorious for blocking a range of Western Web services, including Facebook and Twitter. Google relocated its search service to Hong Kong in 2010 following allegations that the Chinese government hacked into email accounts belonging to activists.